Dare to test your nerve at Valley ‘Frights’ at the first ever TWO DAY ‘DRACULAR SPECTACULAR’. 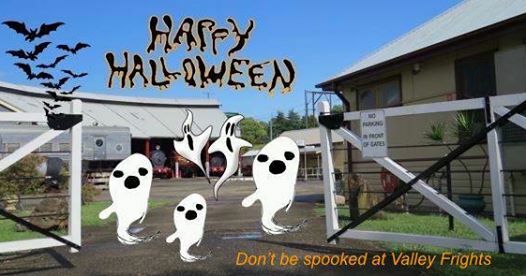 The volunteers at the Valley Heights Rail Museum have been busy tricking up the site in readiness for this popular event. There’s plenty to do! For an out of this world experience, immerse yourself in the sights and sounds of the ‘Tram of Terrors’ & ‘Silver Scares’ then ride the ‘Spooky Express’ steam train as it glides past the ‘Ghost Train’. The whole family can enter the ‘Wacky Witch Hunt' competition with great prizes to be won. The café has a range of tempting fancy foods, while adventurous types can devour a famous ‘Lost Finger Roll’. There’s even face painting (by gold coin donation to the Girl Guides). Plus all the wonderful regular exhibits & attractions will be open for all to enjoy, including the two model rooms. Normal admission fees apply on both days. Page Updated: Wednesday, 07-Nov-2018 14:05:50 PST.